* 10 years experience in Puppy Socialization and obedience training. * Currently reading for Advanced Diploma in Dog Behaviour Management through Compass Education & Training in UK. * Member of the International Society for Animal Professionals (ISAP). * Member of the South African College of Grooming. Basic Obedience : Loose leash walking, sit, stand, down, stay, recall, hides and nail clipping. Puppies are also exposed to different stimuli (equipment) that they will encounter later in their lives. e.g. lawn mover, wheel barrow, wheel chair and equipment e.g. cavalleties, ramp, etc. Canine Capers was established in 2006 and promotes responsible dog ownership over a wide range of aspects, from training (puppy and adult), grooming, weight management through to complying with municipal by-laws. 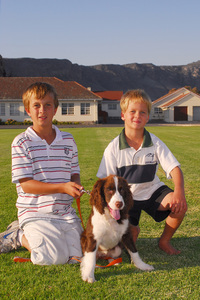 We also coordinate Pets as Therapy (PAT) in the greater Hermanus area.